Shrimp is one of my favorite sources of protein. 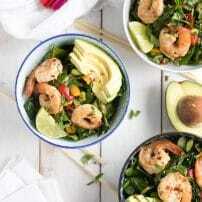 As a result, I’ve added several delicious and easy shrimp dinners here on TFS including, Easy 30 Minute Shrimp and Fish Stew, Shrimp Tostadas with Strawberry Salsa, and Peach and Kohlrabi Summer Salad with Chipotle Shrimp. I am a big fan of easy dinners over here. On the days when I’m not cooking and shooting and our refrigerator isn’t filled with leftovers, the very last thing I want to think about is what to make for dinner. And on those days when Octavian (or just my life) is being particularly annoying, there is no way I would get us fed without my arsenal of easy dinner recipes. 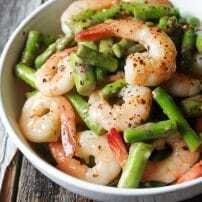 This shrimp and asparagus stir fry is a recently added favorite. Let’s start with the sauce. These ingredients are so super basic and easy to find. You can literally get them in any market. 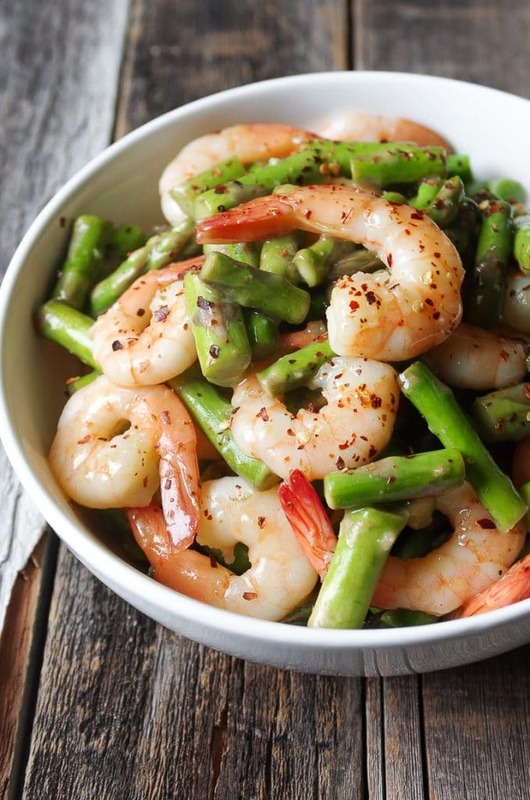 HOW MANY CALORIES ARE IN THIS EASY SHRIMP AND ASPARAGUS STIR FRY? This recipe makes approximately four servings. Each serving has approximately 281 calories. Because obviously, I am killing this whole diet food thing. Totally kidding, you guys! This is not diet food. Or maybe, for a few of you, it is. 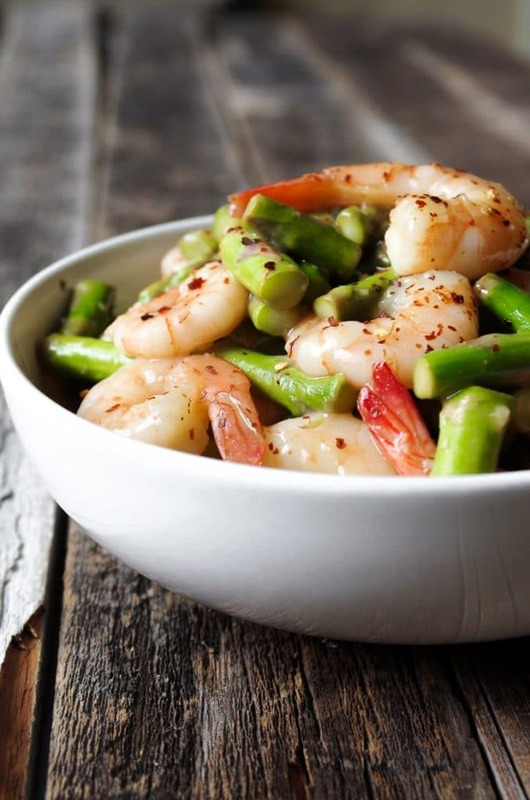 Whatever this Easy Shrimp Dinner looks like for you and your family, it is healthy. Low sugar. No really, this whole thing has just one tablespoon. The only negative, if I had to pick one is that shellfish are high in cholesterol. But as long as you avoid eating loads of shrimp every single day, you’ll be just fine. 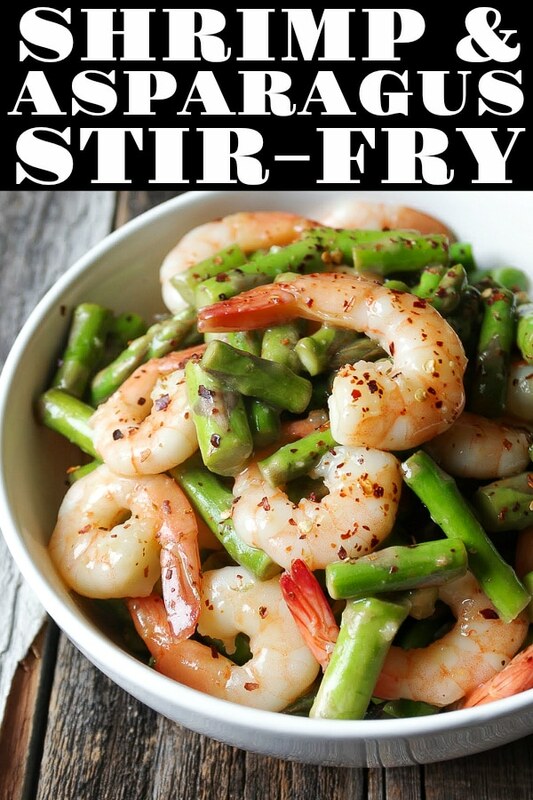 Made with big juicy shrimp, fresh asparagus, and an easy 5-minute lemony stir-fry sauce, this delicious and easy SHRIMP AND ASPARAGUS STIR-FRY is healthy, packed full of protein, and loved by the whole family! Serve with rice or tossed in rice noodles for a complete meal. In a medium mixing bowl whisk together all the ingredients for the lemon sauce and set aside. Heat a large skillet over medium high heat and add 1 tablespoon of olive oil, swirling to coat the bottom of the pan. 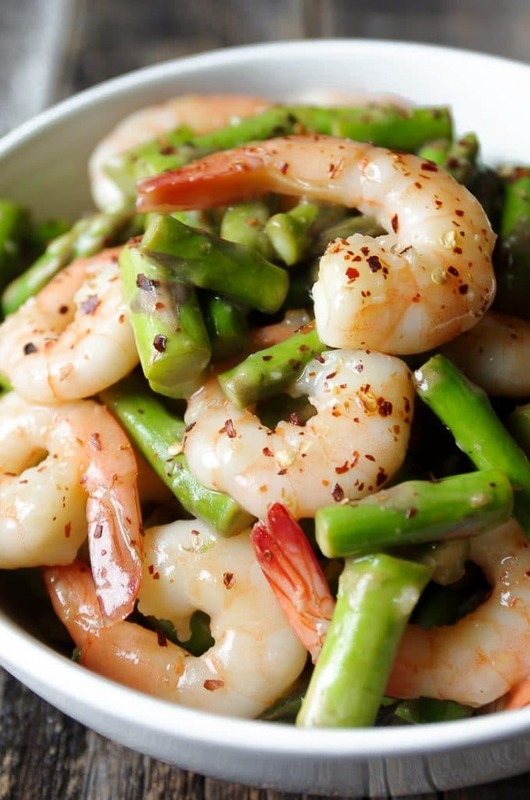 Add shrimp in a single layer to the skillet and sprinkle with salt and pepper. 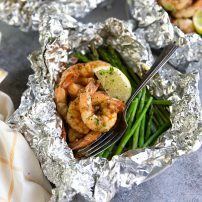 Cook the shrimp for approximately 1-2 minutes on each side before removing from the skillet and transferring to a clean plate. Shrimp should be pink on both sides, but slightly undercooked. In the same skillet add 1 more tablespoon of olive oil and heat over medium high heat. Add the asparagus and gently toss to coat in oil. Sauté the asparagus until tender, but still crispy. It should be a bright green and browned in some places. 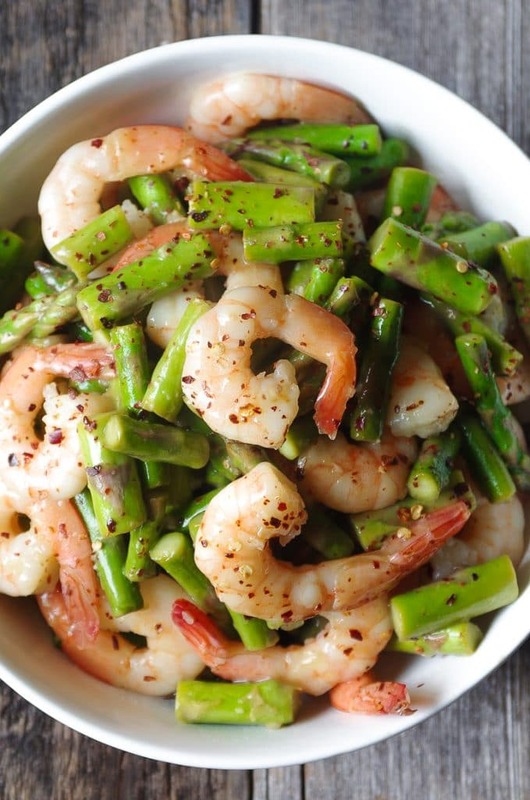 Sprinkle asparagus with salt and lemon pepper (if desired). Reduce heat to medium and add the ginger and garlic; stir to combine with the asparagus. Cook for an additional 1 minute, stirring constantly to prevent the ginger and garlic from burning. Carefully pour the lemon sauce to the skillet with the asparagus and stir to combine. Allow the sauce to simmer for approximately 1 minute, or until the sauce has thickened. Add the shrimp back to the skillet and cook for an additional 1 minute, or until shrimp is fully cooked. Remove from heat and sprinkle with red chili flakes if desired. Best served immediately. Yesterday was just a series of really long minutes that seemed to last forever. Several factors (sickness, rain, a whiny child) pushed me to the edge. You guys, I wasn’t my best self yesterday. I was too impatient and quick to raise my voice. I walked around with a frown on my face and then wondered why my child was unhappy. I nearly lost it. Fortunately, I have had a little time to reflect on yesterday and give myself a break for being the less-than-perfect Mom and Wife that I always aim to be for my family. Yesterday was a mess, and that’s OK. Days will be messy and hard, but it won’t be forever. There will be afternoons where the TV may run hour after hour just so everyone makes it to bedtime without losing their poop. I tried to make beaded bracelets with my child, but he just wanted to make a mess. I opened up a new stacking/sorting toy, but he just wanted to throw the pieces around the room. I tried to get him out the door for a walk when the rain took a 10 minute break, but that resulted in a meltdown and I JUST COULD NOT DEAL. So what does a drowning mom do? I text the one person who will understand- my mom friend. Lick the bowl good! We just had for dinner served with Jasmine rice and it was delicious! 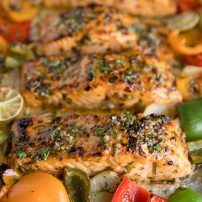 I just.came acroos your site today and am excites to try other recipes! Hi Caroline – thank you for the feedback! !